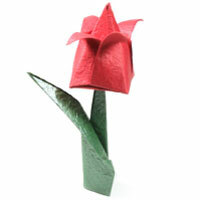 This presents instructions to learn how to make origami tulip flowers. If you are a beginner in origami, try to start with any of easy tulip instructions and if you are becoming comfortable with easy tulip, then you can try traditional tulip. The last instruction is for intermediate folders, so challenge this tulip only when you are comfortable with previous versions of tulip. 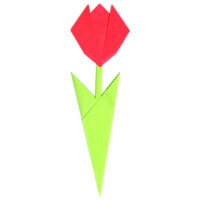 This easy tulip with two leaves is for an origami novice. 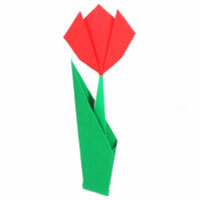 You can easily make this 2D version of tulip with a stem and two leaves. This easy tulip with two leaves II is for an origami novice. 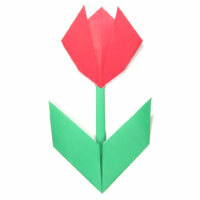 You can easily make this 2D version of tulip with a stem and two leaves. 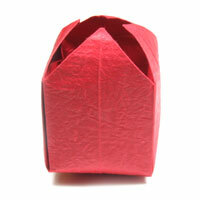 This easy tulip is for an origami novice. You can easily make this 2D version of tulip. After a completion of origami tulip, you can attach a simple origami stem. This tulip is for novice. You will start with a balloon base and it is fairly easy fold.